Screen capture of Deputy Ben Fields assaulting a teenage girl at Spring Valley High School in Columbia, SC. 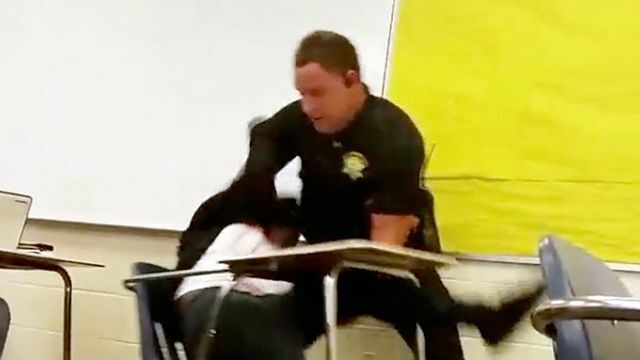 “The school resource officer who was caught on camera violently flipping a South Carolina high school student at her desk has been fired, authorities announced Wednesday. ‘From the very beginning that’s what’s caused me to be upset, and (what) continued to upset me is that he picked the student up and threw the student across the room,’ Lott said. ‘Deputy Ben Fields did wrong this past Monday,’ he added.